Stressing on the need to strengthen the party from booth level, TRS working president K T Rama Rao on Thursday exuded confidence that the party would emerge victorious in the local body polls including panchayat, PACS, MPTC, ZPTC and municipal elections and urged the party cadre to work sincerely in the next six to seven months. He was also confident that the party would win 16 MP seats and subsequently, Chief Minister K Chandrashekhar Rao would be in a position to call the shots in national politics. 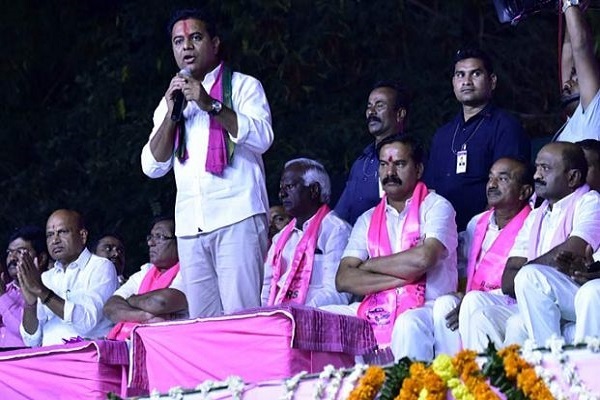 On his maiden visit to the erstwhile Warangal district after assuming charge as TRS working president, Rama Rao was accorded a rousing reception by the party cadre. He was received at Kakatiya Thoranam of Pembarthi and taken to the Preston College grounds in a huge rally in which MLAs Errabelli Dayakar Rao, Muthireddy Yadagiri Reddy, T Rajaiah and MLC Kadiam Srihari participated. Stating that people trusted KCR despite a galaxy of national leaders including Prime Minister Narendra Modi, several Union Ministers and other leaders campaigning in Telangana, he said people had rejected both the national parties BJP and Congress. “BJP had even lost deposit in 105 constituencies,” he remarked. Responding to the request of Palakurthy MLA E Dayakar Rao, Rama Rao said that all the tanks in Jangaon district would be filled with Godavari water through the Devadula lift irrigation scheme in six to eight months, besides developing the Hyderabad-Warangal industrial corridor. “I will also see that a mini-textile park is set up at Kodakandla in Palakurthy constituency. Setting up a leather factory in Station Ghanpur constituency is also under consideration,” he added. Speaking on strengthening the party from the grassroots, he said construction of party offices in all district headquarters would be done in six months. He also hinted that one of the three MLAs from Jangaon district would get a Cabinet berth. “We will also construct party offices in each Assembly constituency,” he added. Later, he participated in a roadshow from Madikonda to Hanamkonda, and performed Bhoomi Pooja for construction of the party office ‘Telangana Bhavan’ at Balasamundram in Hanamkonda. Speaking on the occassion, Rama Rao said he decided to kick-start his tour to districts after assuming charge as working president from erstwhile Warangal district as the Chief Minister had asked him to visit Warangal first. “Warangal played a crucial role in the separate Telangana movement. Warangal is synonymous with Telangana movement,” he said. Thanking the TRS workers for their commitment, he said the party bagged 88 seats only due to the hard work put in by the party workers. “TRS workers helped us get 88 seats. It is not a routine victory. I dedicate this to the workers,” he said, and added that Praja Kutami had got only 56 lakh votes while the TRS got 98 lakh votes. Former Minister Etela Rajender, Redya Naik, MLA elects D Vinay Bhaskar, Peddi Sudarshan Reddy, Challa Dharma Reddy, N Narender, A Ramesh, V Satish, Shankar Naik, E Dayakar Rao, MPs V Lakshmikantha Rao, Banda Prakash, P Dayakar, former deputy CM K Srihari and others were present.